Through Fri., Sept. 23: A surreal, lovely large-scale sculpture show is accompanied by a free audio tour of the works at Metro Tech, in downtown Brooklyn (just off the F Jay St./Metro Tech stop). The show is presented by the Public Art Fund, and features commissions by New York-based artists and a free audio tour of the works. The artists featured are Martin Basher, Zipora Fried, Sam Moyer, Matt Sheridan Smith, and Kevin Zucker. The exhibition’s title, TOTAL RECALL, is borrowed from Paul Verhoeven’s 1990 film, in which the protagonist discovers secretly implanted personal memories that form his reality. The works in TOTAL RECALL are united through their power to create a new experience for viewers outside of the everyday, toying with projected meanings and utilizing recognizable images and forms to create something new. Compelling in material presence, these sculptures both absorb and reflect ideas of the past, appropriating consumer detritus, found objects, and collective nostalgia. 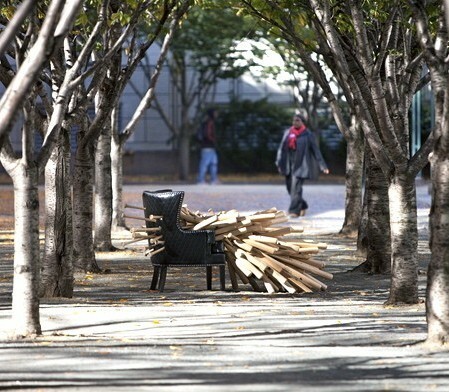 Public Art Fund has been presenting exhibitions at MetroTech Center since 1993. A free Guide by Cell audio tour of TOTAL RECALL can be heard by calling 646-862-0937. Tour includes introduction by exhibition curator Jesse Hamerman and commentaries by the individual artists. MetroTech Center Commons is located in downtown Brooklyn between Jay Street and Flatbush at Myrtle Avenue.